Next weekend sees the inaugurations of a brand new Dutch showcase festival, Left of the Dial, which aims to bring together the very best in post punk, punk, garage, shoegaze, and noise rock. While the lineup draws heavily on the fervent Dutch scene that has exploded recently, many international bands will be present too, with the UK represented by the likes of Alligator, Bad Nerves, and Honey Hahs. We're also extremely proud to be Official Media Partners of the inaugural edition, and will be reporting from Rotterdam next week. We sat Rotterdam resident Jasper Willems and our Amsterdam-based Editor-In-Chief Derek Robertson down to preview the new festival, discuss it's hopes and goals, and why it's such an important event in the Netherlands. Right now, Rotterdam is bustling with headstrong guitar-based music, with remarkable bands like Lewsberg, The Sweet Release Of Death and Rats on Rafts in the ranks. It’s the result a lot of small autonomously operating venues, clustering and materializing organically over the past decade – to name a few, WORM, Roodkapje, MONO, Rotown, V11. The threshold to see great live music is very low here, so naturally, Rotterdam’s infrastructure is very fertile for a brand new showcase festival Left Of The Dial to make an immediate, resounding impact. Though I’m very excited about its inaugural edition, I do have some slight reservations about the festival’s nuts and bolts. Generally speaking, I’m a bigger fan of allowing things to grow bottom-up on a slightly smaller scale, as opposed to present it more ambitiously from the outset, with almost 50 bands spread across town. That being said, Left Of The Dial’s lineup – though entirely devoid of big marquee names – is, for the most part, fantastic and worth exploring, brimming with both emerging talent and those “Hey, why didn’t I appreciate them more up til now?”-sleeper type of bands. From the former category, I took an early shine on Italian clique Any Other, who scratch that pertinent Pacific Northwest indie rock itch. Then there’s Steady Holiday, one of those all-encompassing polymaths who operates on the same artistic wavelength as Mitski or Japanese Breakfast. And sure, Slow Crush do shoegaze by-the-book, but also in such satisfyingly fresh way. From the latter category, I gotta go with your resident corrosive noise rock nihilists Die Nerven and Bambara. Then there’s Camera, a risk-reward type gambit at any fest they play. The reward: this band sounds ridiculously amazing even in the most impoverished of settings. The risk: they allegedly enjoy decorating dressing rooms with their own feces. So all in all, like any new showcase festival, Left Of The Dial will probably endure its share of necessary growing pains. But I reckon the more pressing objective is – to paraphrase Mr. T – to treat yo’ Teutonic krautrock firebrands right. I’m a big fan of both Lewsberg and The Sweet Release Of Death, and I must say, the more I dive into the Dutch scene, the more fantastic bands I find. Just glancing at this lineup I see the likes of Howrah, Canshaker Pi, and Charlie & The Lesbians, all fantastic acts that I’ve seen over the course of the last 12 months. And then there’s Those Foreign Kids, who I’ve heard great things about. There are plenty of UK and Belgian acts playing too, but I wonder - is this something of an attempt to give the Dutch scene it’s own showcase festival? A platform for all these bands to come together in one place, one weekend, and hopefully, attract a bit more attention? Ooh, Those Foreign Kids are brilliant indeed, they remind me a lot of early Liars, but with the pop scrunch a band like No Age apply. And you’re right, Left Of The Dial can potentially bolster the ‘guitar scene’ on a more Euro-centric playing field, instead of a playing field dominated by just UK/US/Canada-based bands. I like that a huge part of the line-up seems to be mobilized by a lot of Dutch scenes, with older bands forming new alliances at a ridiculous tempo. The new kids on the block, KIEFF, Steve French, Real Farmer and Price are all great. There’s no real sense of competition: if kids are fans of each other’s work, chances are they’ll just form another band together on the fly. That seems quite rare for a scene - the idea that there are very few egos involved, or a sense of getting ahead of the competition. There are a few like that in london, but they’re rare - most of the time, it’s only natural that bands want to get covers and column inches for themselves, or the best deal on a cool label. What makes everything so inclusive here? Do the individuals really not care about glory for themselves, and reaching a wider audience? It’s admirable, I’ll say that, and the idea of such a festival that’s incredible inclusive - and full of creative cross pollination - sounds encouraging; elevate your peers, and they will elevate you. That’s precisely what’s happening. DiS recently published an interview I did with Pip Blom, who is getting some substantial airplay in the UK. I was taken aback by how unflappable and circumspect she was about her rapid success. She told me that as long as it’s fun and creatively viable for the band, that’s enough reason to keep doing it. Left Of The Dial seems to be really ‘dialed’ – pun intended – into that type of mentality; Bull and Canshaker Pi have grown close by touring together in the UK. The festival gave The Homesick’s Jaap van der Velde a voice with his own curated program, and I really like Jaap. It’s easy to forget that he’s still just 21 years old. But he never gets carried away by all the industry stuff, he just wants to make things. When you’re dense, modest about your goals and comfortable doing things on a DIY level from the outset, you learn to take all the non-music related hoopla sort of in stride. From what I’ve heard, that type of collaborative mentality blooming here comes way more natural in Eastern Europe – something you’ve seen firsthand at festivals like MENT. It’s cool to see it spreading over to the Benelux. That’s the way it should be, and it’s a stark contrast to the UK scene and festivals like the Great Escape which can descend into one big, Nathan Barley-esque circle jerk of trying to “outcool” everyone else. It looks like an ambitious festival in terms of the number of bands and whatnot, but it’s sensible to limit it to two days - keep it short and sharp, so people can dip in and out of it as they see fit. Does Left of the Dial have a five or ten year plan, about how they hope to grow and what they want to achieve? There’s a funny irony in that, because I have a strong impression the organizers’ visit to The Great Escape fueled the incentive to do Left Of The Dial. This year’s TGE edition had, as you know, The Netherlands as its focus country. I do feel Left Of The Dial wants to grow and expand each year, and not just in the field of guitar-based music, but in all kinds of genres. You have to start somewhere: I mean, Le Guess Who? started as a fest putting up exclusively Canadian bands, and it’s now something else entirely. I feel the emphasis on bands at Left Of The Dial is purely out of necessity because a lot of festivals don’t give the smaller, more headstrong bands a proper platform. You have to either be a big name or featured on an influential site like Pitchfork or The Guardian. In truth, a lot of the bands on Left Of The Dial deserve way more attention than they’re given. For every IDLES-like success story there are a bunch of bands like CROWS, who are – in their unique way – just as compelling to witness. 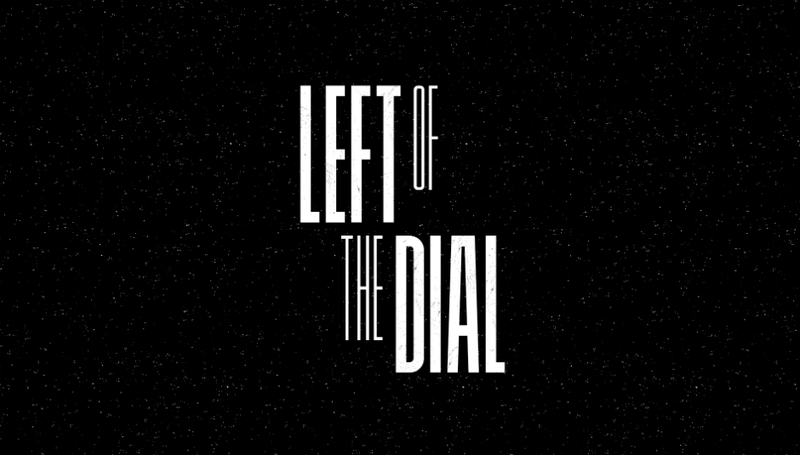 Left Of The Dial takes place in Rotterdam on the 19 & 20 October. For more information about the lineup, and to purchase tickets, please visit their official website.